The most frequently asked-for articles by new growers are those on culture; these can be generalised as the “How to do something” article. As a new grower myself some 40 years ago, I enjoyed reading many such articles in the orchid journals of that time. When our editor asked if he could reprint an address I had given recently at an orchid gathering, he finally made up my mind for me – to put down some of my experiences with growing orchids in the hope that they may fill part of the gap wanted by new growers. What follows are a series of articles, not in any structured order, on some of the basics that need to be considered in orchid culture. With a little chemistry, a little physics, and a little biology, I hope we can all arrive at a lot of common sense in culturing orchids. For readers who need more ‘science’, I recommend The Orchid Grower’s Manual by Gordon C. Morrison [Kangaroo Press; ISBN 0 86417 227 3]. To grow and flower, orchids must receive the basic necessities of life: light, water, air, and mineral nutrients. Maximum growth and flowering will occur only when all these factors are supplied at their optimum levels. There is usually good agreement between growers about the amount of light and air needed for best growth and flowering, but differences of opinion often occur over the correct amount and methods of supplying water and the fertilisers which contain the nutrients orchids need. Here the role of water in the life of orchids is discussed. Water is a colourless, odourless and tasteless liquid at normal temperature and pressure. Water is the most common liquid on earth, and more substances dissolve in water than in any other liquid. This property is very important for biological systems because all biochemical reactions take place in solution. Water is one of the few, perhaps the only, liquid that expands when it solidifies into ice at 0.4 oC. Therefore, ice is lighter than water and floats. If water did not have this property, all the fresh water would be as ice at the bottom of the oceans. Water has a higher surface tension than most liquids. Think of this as the water molecules liking to stick close together. Hence, a drop of water is spherical in shape whereas a drop is alcohol is flat in shape because alcohol has a much lower surface tension than does water. In a thin column of water such as in a very small capillary tube, a tug on one end causes the whole column of water to move rather than the column to break. This property of surface tension becomes important in moving water around the plant. Water has a high latent heat. This means that a lot of extra heat must be absorbed when ice melts and this heat must be given up again when water freezes. Similarly, when liquid water evaporates, it absorbs more heat that most other liquids. These properties can be used to cool or heat the environment of orchids. We can make use of each of these unique properties of water to grow our orchids better — so water is more than just H2O to us and to an orchid plant. Water is the essence of life. Without it, life, as we know it, cannot exist. In living cells, all chemical reactions take place in a solution in water. All living things, both plant and animal, are composed mainly of water. For example, most live plants contain from 80% to 90% water. Lack of a regular supply of water leads to dehydration, desiccation, and ultimately death – and no hobbyist wants to kill their orchids. We can consider a plant cell as a water-filled sack containing substances in solution and solid structures such as the nucleus and mitochondria where certain chemical reactions can occur. Membranes surround this sack of water-solution and control the entry of water and other substances into and out of the cell. The whole lot if contained within solid walls that give structure to the plant – but these walls have pores that allow adjacent cells to have contact with each other and exchange chemicals between them. So plants can be thought of as a lot of inter-connected water-filled sacks held together within permeable stiff walls. It has been said that more orchids have been killed by an oversupply of water than by too little water. So it is important that we understand the role of water in the daily life of an orchid plant if we are to grow and flower that plant at its best. If we understand why we need to water an orchid plant, we can better understand how and when to water it. To understand why we must water plants, we need to understand the term relative humidity, and how plants use water in their life cycle to absorb nutrients and move nutrients from the roots to the shoots; that is we need to understand the processes of transpiration, nutrient uptake and nutrient translocation. Humidity is the term given to the amount of water held in the air. At each temperature, air can hold only a certain amount of water before it becomes saturated and the remaining water must be deposited as dew, mist or rain. As the temperature rises, the air can hold more water; as the temperature falls, the air can hold less water. The amount of water held in the air at any temperature can be related to the amount of water that it can hold when saturated at that same temperature; this is referred to as the relative humidity of the air. When the air is saturated with water, it is said to be at a relative humidity of 100%. Plants must loose water to the atmosphere in the process of transpiration to function correctly. If the air is saturated with water at 100% relative humidity, plants cannot transpire. So maintaining too high a relative humidity is not an advantage for the plant. Likewise, too low a relative humidity is not an advantage because the plant may loose water to the atmosphere more rapidly than it can absorb more water from the compost. Under these conditions, the plant can quickly become desiccated and die. Because plants must loose water from their leaves or transpire if they are to function correctly, we need to consider the process of transpiration and its relationship to plant growth. Because most of the live orchid plant is made up of water, it needs more water to make into new cells. However, most of the water absorbed by the orchid plant is not used in making new cells; it is lost to the atmosphere in a process called transpiration. At first, this might seem wasteful. However, we should examine the transpiration process from the viewpoint of it causing an unbroken stream of water to move from the compost, into the roots, through the roots into the stem, up the stem into the leaves, and out through the stomata (the pores in the leaves of the orchid) into the atmosphere. Plants could not survive without this stream of water flowing from the soil through the plant, and into the atmosphere. Inside the plant root and stem, there is a continuous ‘pipe’ of dead cells called the xylem. These cells act as a series of interconnected very small capillary tubes that the plant uses to transport water and dissolved substances from the root to the leaves. Think of the cells within the leaf as being bathed in a continuous film of water. On the underside of the orchid leaf there are small pores called stomata that open and shut in response to light, carbon dioxide concentration of the atmosphere, and the water relationships of the plant. When the stomata open, water evaporates from the film covering the cells within the leaf. Because water molecules like to stick together, the surface tension of water causes a potential to build up inside the leaf for water to move towards the place from which water is being lost. Think of this potential as a force pulling water towards the leaf through the small capillary tubes of the xylem in the leaf, stem and roots. So the evaporation of water from the surface of cells within the leaf – the process called transpiration – pulls water up the roots and stem and into the leaf. Thus, water moves from a location of high water potential [think of it as a high water concentration or high energy level] in the roots to an area of lower water potential in the leaves because the surface tension of water makes it want to come to the same potential. Therefore, to get water from the compost into the orchid plant, we make use of the high surface tension of water. Another function of transpiration is to cool the plant. The leaves could become very hot if it were not for the loss of water by evaporation through the stomata. This is where the high latent heat of water becomes important to plants. As water evaporates, it absorbs more heat per unit volume than most other liquids and this heat is taken from the leaves as the water evaporates during transpiration. As well as using the property of the high latent heat of water to cool our plants, we can make use of this property of water to also warm our plants during cool nights. By placing bottles of water amongst the plants during the day, the water is warmed. This heat can be returned to the atmosphere, as the air becomes colder during the night. It may be only a few degrees that we are talking about, but that may be all that is needed to keep the plants growing better. Where water moves within a plant, so also will substances dissolved in that water stream. Thus, a major function of transpiration is the movement of nutrient elements into and within the plant. As water streams towards the root in the soil or compost, it carries some nutrient elements (i.e. fertiliser nutrients), such as nitrogen, potassium, and sulphur, towards the root from areas that would not normally be accessed by the root. Thus, the streaming of water towards the root in the compost increases the volume of compost that the root has access to, and from which the root can absorb nutrients. In orchid composts, streaming of water and nutrients towards the roots will continue to occur so long as there is an unbroken film of water over or between the particles of the compost. When this continuum of water is broken by the compost becoming too dry, the streaming of both water and dissolved nutrients will stop. When the water and dissolved nutrients enter the root, they can be moved to the stem and leaves in the transpiration stream. This process of movement of nutrients is called nutrient trans-location. Another function of the transpiration stream is in the transport of certain nutrient elements such as calcium, magnesium, and potassium from roots to shoots and leaves where they are needed for the daily requirements of cell life. The transport of nitrogen as nitrate ions occurs solely by way of the transpiration stream. Orchids require the same nutrient elements for healthy growth that other plants need. Orchids can only absorb these nutrient elements when the nutrients are dissolved in water. The roots of most orchids cannot function when they are starved for oxygen in waterlogged compost. One of the aims of watering an orchid is to provide the water needed for growth, and to provide the vehicle for dissolving the nutrient elements the plant uses in its cycle of life. Providing sufficient water and nutrient elements for healthy growth and flowering is part of the art of good culture. 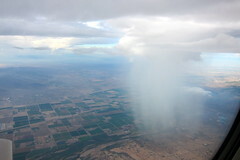 A plant held continuously in an atmosphere of 100% relative humidity would not loose water to the atmosphere. Thus, it will be unable to transpire and so would slowly die from lack of nutrients because its transpiration stream would be virtually closed down permanently. Therefore low relative humidity is not altogether a bad thing, provided the plant can obtain sufficient supplies of water from the compost to replace the water lost in the transpiration stream.